Belly fat is a common problem with both men and women. And considering that we eat a lot of fatty foods inNigeriamakes it easily possible to gain fat around the belly quite rapidly.Belly fat is just not ugly, its also associated with a higher risk of other cardio vascular diseases like diabetes etc. Belly fat can instantly give an average individual a low self esteem. The first sign that you will know that you have belly fat is if you find it difficult for you to wear into clothes that would normally fit around your waist. It becomes easily obvious when you notice that the thick skin around your belly moves or vibrates more than usual when you engage in some activity. Infact, for some others, this fat sticks out noticeably or flops down over their belt. But just what is belly fat and why should you be concerned at all? There are actually two types of belly fat. 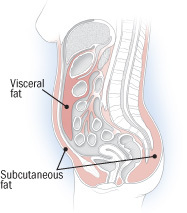 They are Visceral fat and Subcutaneous fat. Don’t let the big name confuse you. I will explain it. It disturbs the ability of the body to manage insulin. And many other harmful effects on the body. Now you can see why it is such a dangerous fat to have, apart from the fact that its ugly. If you are reading this article and you have Belly Fat, I congratulate you because right inside this article, I am going to show you 3 steps that you can use to permanently get rid of these unwanted ugly fat around your belly. Unfortunately, there is no magic pill or one specific tablet that can make it disappear. However, its never too late to get rid of fat around your stomach. As Nigerians, we eat a lot of high carbohydrate and fatty foods. Imagine, Rice in the morning, Eba in the afternoon, Pounded Yam With Egusi soup and Chicken at night. These foods are extremely high in calories because they contain a lot of carbohydrate. The palm oil in Egusi soup alone contains as much as 2000 calories (6 teaspoonful). If you want to get rid of belly fat, you must get rid of all fatty foods that you eat and replace them with food high in fibre e.g. Oatmeal (Quaker) and Wheat. Eat more of fruits (e.g. Apples) , Vegetables, lean protein (.e.g Goat meat; more healthier than cow meat), and Run as fast as your leg can carry you away from all sugary drinks and processed or canned foods. SIDE NOTE: I recently wrote a free 16 page report where i shared 3 delicious Nigerian foods that kill stomach fat and 2 food to stop eating to live a healthy life style. You can access these free report by clicking here to sign up for it. Step # 1 – Put an exercise mat on the floor, if you don’t have one, lay a large towel on your sitting room floor…. Step #3 – Simultaneously lift your torso and legs up with your knees bent. Try to bring your knees and chest as close together as possible. Flex at the top of the movement. Step #4 – Slowly lower your body back down until you are lying flat on the ground. Step #5 – Breathe and repeat this step over again. NOTE – Do 10 of this everyday. When you first try it, it will be very difficult, but it will become easier as you do more of it. It is because you are doing it for the first time. DO NOT GIVE UP. I have also included a video below to show you how this is done so you can try it. Do not eat too late at night. Try your best to eat your last meal of the day at least 3-4 hours before you go to bed. This gives your body to digest it. If you feel hungry, snack on fruit instead. If you have enjoyed this article or learnt one thing or two, I want you to leave comments below and do not forget to share this article with your friends and loved ones.